Jennifer Farley profiles a local painter's tractor garage-turned-studio in Columbia County. 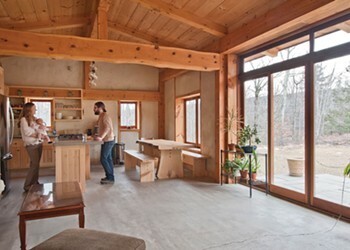 Jennifer Farley profiles a contemporary take on the classic cabin in the Catskills National Park. Jennifer Farley profiles a construction manager’s dream home. Jennifer Farley profiles Flatbush’s most fabulous stone house. Jeffrey Adkisson’s Stockport salvage brings Montauk to the Hudson.